Well, here we go again. Friday, Saturday and Sunday (November 16,17 and 18) only. 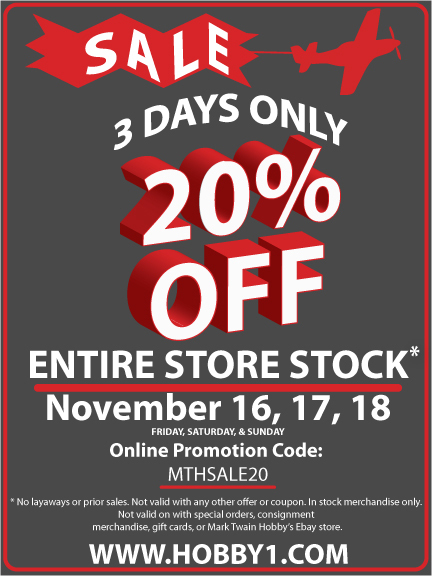 Mark Twain Hobby Center will be having a 20% OFF whatever you can carry to the register sale. So load your carts into your car and come on in. Just as a reminder this sale does not include gift cards, lay-aways, consignment or used items or special orders of our Ebay store. However, anything else that does not fall into those categories is on sale, even stuff that would normally not be discountable. This is our way of saying thank you to all of our valued customers and friends.